Received April 2, 2015; Revised April 28, 2015; Accepted May 31, 2015. 편평태선은 면역 매개 점막피부 질환으로 병인은 여전히 알려져 있지 않고, 중년의 백인 여성에서 흔히 발생하고 구강 점막에서 증상이나 징후가 생기기도 한다. 편평태선의 피부 병소는 가려움을 유발하나 자기 제한적이고, 구강편평태선의 구강 병소는 만성적이고 좀처럼 스스로 치유되지 못하고, 드물긴 하나 잠재적으로 전암 병소로 발전할 수 있다. 구강편평태선은 비록 비치태 연관 질환이나 통증, 출혈로 인해 적절한 치태 조절이 어렵게 되어 치태 연관 질환을 야기할 수 있고, 작열감, 자발적인 출혈 등 구강편평태선과 관련된 점막 증상이 축적된 치태에 의해 더욱 악화될 수 있다. 따라서 구강편평태선 환자에서 구강편평태선 자체의 약물적 치료뿐만 아니라 적절한 구강 위생 관리, 치석 제거 등의 치주치료가 동반되어야 한다. 본 증례에서는 구강편평태선 환자에서 국소적인 코르티코스테로이드 치료뿐만 아니라 구강 위생 교육을 포함한 치주 치료를 통해 증상 및 징후를 개선시키고 재발 방지를 도울 수 있었다. Lichen planus is an immune-mediated mucocutaneous disease, affects more frequently middle-aged Caucasian women and makes signs and symptoms in the oral mucosa. Cutaneous lichen planus lesions cause itching but they are self-limiting, oral lichen planus lesions are usually chronic, recalcitrant to treatment and potentially premalignant in some cases. Although, oral lichen planus is non-plaque related disease, they possess particular problems because plaque control is complicated by pain and bleeding and might cause plaque-related disease. The resulting condition comprises accumulations of plaque, which again can influence the progress of oral lichen planus with burning sensation, spontaneous gingival bleeding. 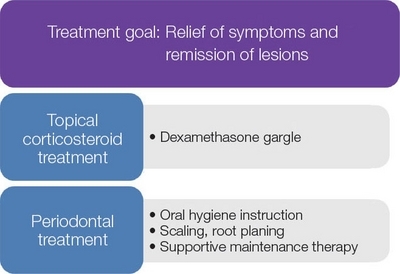 Thus, it should be noted that both medication and supportive periodontal treatment are essential for the remission of the lesions. 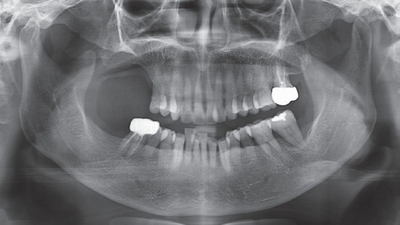 This case report introduces topical corticosteroid therapy and supportive periodontal treatment including intensive oral hygiene procedures to obtain an improvement of subjective symptoms and objective changes and to prevent relapse the lesions. 구강편평태선은 비록 비치태 연관 질환(non-plaque-related diseases)이나 통증, 출혈로 인해 적절한 치태 조절이 어렵게 되어 치태 연관 질환(plaque-related diseases)을 야기할 수 있고, 작열감, 자발적인 출혈 등 구강편평태선과 관련된 점막 증상이 축적된 치태에 의해 더욱 악화될 수 있다.10 따라서 구강편평태선 환자에서 구강편평태선 자체의 약물적 치료뿐만 아니라 적절한 구강 위생 관리, 치석 제거 등의 치주치료가 동반되어야 한다. 본 연구에서는 구강편평태선 환자에서 치주치료를 동반하여 증상 및 징후가 개선된 증례를 보고하고자 한다. 47세의 여자 환자가 잇몸이 따가워서 양치질하기 힘들다는 주소로 치주과에 내원하였다. 환자의 구내 검사시 치은에서 미란과 홍반이 관찰되었고, 통증과 출혈 때문에 양치질에 의한 치태 조절이 거의 불가능한 상태였다(Fig. 1). 병소는 구강내 치은에서만 관찰되었고, 피부 병소는 관찰되지 않았다. 4 mm를 초과하는 깊은 치주낭이나 동요도를 보이는 치아는 없었고, 방사선 사진상 하악 좌측 제1대구치(#36) 이개부 치조골 소실이 국소적으로 보였으나, 수직적 골소실을 보이는 곳은 없었다(Fig. 2). 진단은 경도의 만성 치주염 및 구강편평태선으로 내리고, 원활한 치태조절을 위해 먼저 구강편평태선 통증 완화 치료를 시행하기로 계획하였다. 국소적인 코르티코스테로이드를 사용하기로 했으며 구내 국소도포는 점막에 오랫동안 부착된 경우에만 효과가 있으므로 구강세척액으로 덱사메타손 구강세척액(dexamethasone gargle 0.05%)을 하루 4번 사용하도록 지시하였고 저자극성 치약과 부드러운 칫솔을 사용하여 양치질 하도록 구강위생교육을 하였다. 약 3주 후 양치질시 통증이 많이 완화되어서 초진시보다 치태조절이 원활히 되는 것을 확인하였으며, 전악 치석제거, 치근활택술을 시행하였다(Fig. 3). 이후 매달 내원시켜 전문가 치태조절을 시행하였으며, 6개월이 지난 후 구강편평태선 병소는 거의 사라진 것을 확인 후 지속적인 정기 점검을 실시하고 있다(Fig. 4). 치료 시작 후 2년이 되는 시점까지 구강편평태선이 재발하지 않고 환자의 구강위생도 잘 조절되고 있음을 확인하였다(Fig. 5). Pretreatment clinical view of case 1. Note the gingival erosion and erythema and accumulation of dental plaque. 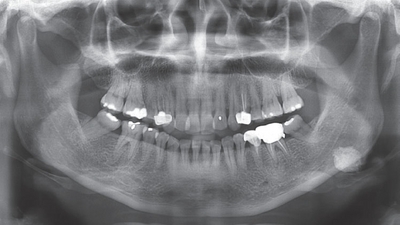 Pretreatment radiograph of case 1. Although furcation involvement of left lower first molar region was found, generalized alveolar bone loss was not severe. A diagram representing combined treatment approach. Posttreatment at 6 month of case 1. Note the remission of gingival erosion and erythema and improvement of oral hygiene. Posttreatment at 2 year of case 1. Note no relapse of oral lichen planus and maintenance of gingival health. 56세의 여자 환자로 구강편평태선으로 구강내과에서 지속적인 치료를 받고 있으나, 계속되는 치은 통증과 치은 부종으로 치주과로 의뢰되었다. 구내 검사시 치은의 미란과 홍반이 관찰되었고, 하악 좌측 제2대구치(#37)와 하악 우측 제1대구치(#46) 부위에서 치은 부종과 농양, 탐침시 출혈이 관찰되었고 특히 하악 좌측 제2대구치에서 수직적 골소실과 함께 2도의 동요도, 7 - 8 mm 정도의 치주낭이 존재하였다(Fig. 6, 7). 상악 우측 대구치를 치주염으로 3년전 상실한 이후 구강편평태선으로 보철 치료를 받지 못하여 좌측만 저작을 하여 국소적인 치주염이 악화된 것으로 추측되었다. 또한 구강편평태선으로 적극적인 치태관리를 환자 스스로 하지 못해 구강내 전반적인 중등도의 만성 치주염이 악화되었다고 진단내리고, 덱사메타손 구강세척액(dexamethasone gargle 0.05%) 등의 국소적인 코르티코스테로이드 치료에 덧붙여 적극적인 치주치료를 시행하기로 하였다. 전악에 걸친 치석제거, 치주소파술을 시행한 후 하악 대구치 부위에는 추가적으로 바스법의 양치질 교육을 시키고 3개월마다 정기 점검을 실시하였다(Fig. 3). 치료 시작 후 1년이 되는 시점까지 구강편평태선이 악화되지 않고 하악 대구치 부위의 치은 통증, 부종 등도 많이 완화된 소견이 관찰되었다(Fig. 8). Pretreatment clinical view of case 2. Note the gingival erosion and erythema with gingival swelling and abscess at lower molar areas. Pretreatment radiograph of case 2. Although vertical bone defect of left lower second molar region was found, generalized horizontal alveolar bone loss was well maintained. Posttreatment at 1 year of case 2. Note the remission of gingival erosion and erythema and subsided state of lower molar areas. 구강편평태선의 임상적 특징은 정확한 진단을 내리는 데 있어 어려움을 초래할 수 있다. 그러나 조직병리적 평가와 함께 절개생검은 임상적 진단을 내리고, 이형성, 악성 가능성을 배제하기 위해 추천된다.5 진단은 구강편평태선의 임상적, 조직학적 검사에 근거를 두는데, 임상적 특징은 구강 점막에서 양측성의 레이스와 같은 각화성 망상형, 구진형(keratotic reticular, popular) 병소 뿐만 아니라, 미란형/궤양형, 위축형 병소 등을 대표적으로 꼽을 수 있다.11 조직학적 특징은 과각화증, 기저세포의 퇴행성 변화, 림프구와 조직구로 구성된 밴드 모양의 상피하 염증성 침윤이다.12 본 증례에서는 절개생검은 하지 못하고, 임상적 특징에 근거하여 구강편평태선으로 진단을 내리고 치료하였으나 절개생검을 통한 조직학적 평가를 동반했다면 확진에 더욱 도움이 되었을 것이다. 구강편평태선 환자에서 치주 질환의 심도는 악화된 구강편평태선 병소의 증상과 더불어 깊어지고, 이로 인해, 치주 질환을 야기하는 미생물(Aggregatibacter actinomycetemcomitans, Porphyromonas gingivalis, Prevotella intermedia, Tannerella forsythia, Treponema denticola)의 양을 증가시킨다. 바이러스와 유사하게 치주 질환을 야기하는 미생물은 구강편평태선의 발병에서 중요한 역할을 한다. 구강편평태선과 치주 질환을 야기하는 미생물간 관계는 2가지 가설에 의해 설명될 수 있다. 본 증례에서도 환자들은 초진시 구강편평태선으로 인해 양치질시 극심한 통증과 출혈로 구강 위생 관리를 전혀 하지 못하는 상태였고, 이로 인해 치은 염증 및 증상이 더욱 악화되고 있었다. 우선 국소적인 코르티코스테로이드 치료로 증상을 완화시킴과 동시에 저자극성 치약을 이용하여 집에서 양치질을 효과적으로 할 수 있도록 교육시키고 치석제거, 치근활택술 또는 치주소파술을 동반한 치주치료를 진행하였다. 그 결과 환자의 구강편평태선 병소의 크기나 범위도 많이 감소하였고 치은 출혈, 통증 등의 증상도 현저한 개선을 보였다. 또한 구강편평태선으로 오랜 기간 국소적인 코르티코스테로이드 치료를 받고 있음에도 통증 등이 조절되지 않는 경우에도 추가적인 치주치료로 통증 완화 및 구강편평태선 병소 개선 및 치주염 치료까지 효과를 볼 수 있었다. 구강편평태선은 중년의 여성에서 종종 나타나는 구강점막 질환으로 국소적인 코르티코스테로이드 치료뿐만 아니라 구강 위생 교육을 포함한 치주 치료를 통해 증상 및 142징후를 개선시키고 재발 방지를 도울 수 있다. Guiglia R, Di Liberto C, Pizzo G, Picone L, Lo Muzio L, Gallo PD, Campisi G, and D’Angelo M. A combined treatment regimen for desquamative gingivitis in patients with oral lichen planus. J Oral Pathol Med 2007;36:110-6. Salgado DS, Jeremias F, Capela MV, Onofre MA, Massucato EM, and Orrico SR. Plaque control improves the painful symptoms of oral lichen planus gingival lesions. A short-term study. J Oral Pathol Med 2013;42:728-32. Eisen D, Carrozzo M, Bagan Sebastian JV, and Thongprasom K. Number V oral lichen planus: clinical features and management. Oral Dis 2005;11:338-49. Choonhakarn C, Busaracome P, Sripanidkulchai B, and Sarakarn P. The efficacy of aloe vera gel in the treatment of oral lichen planus: a randomized controlled trial. Br J Dermatol 2008;158:573-7. Lodi G, Carrozzo M, Furness S, and Thongprasom K. Interventions for treating oral lichen planus: a systematic review. Br J Dermatol 2012;166:938-47. Scully C, and el-Kom M. Lichen planus: review and update on pathogenesis. J Oral Pathol 1985;14:431-58. Eisen D. The clinical features, malignant potential, and systemic associations of oral lichen planus: a study of 723 patients. J Am Acad Dermatol 2002;46:207-14. Gorsky M, and Raviv M. Efficacy of etretinate (tigason) in symptomatic oral lichen planus. Oral Surg Oral Med Oral Pathol 1992;73:52-5. Ertugrul AS, Arslan U, Dursun R, and Hakki SS. Periodontopathogen profile of healthy and oral lichen planus patients with gingivitis or periodontitis. Int J Oral Sci 2013;5:92-7. L?pez-Jornet P, and Camacho-Alonso F. Application of a motivation-behavioral skills protocol in gingival lichen planus: a short-term study. J Periodontol 2010;81:1449-54. Thorn JJ, Holmstrup P, Rindum J, and Pindborg JJ. Course of various clinical forms of oral lichen planus. A prospective follow-up study of 611 patients. J Oral Pathol 1988;17:213-8. Holmstrup P, Schiøtz AW, and Westergaard J. Effect of dental plaque control on gingival lichen planus. Oral Surg Oral Med Oral Pathol 1990;69:585-90. Ram?n-Fluix? C, Bag?n-Sebastian J, Mili?n-Masanet M, and Scully C. Periodontal status in patients with oral lichen planus: a study of 90 cases. Oral Dis 1999;5:303-6. Lo Russo L, Fedele S, Guiglia R, Ciavarella D, Lo Muzio L, Gallo P, Di Liberto C, and Campisi G. Diagnostic pathways and clinical significance of desquamative gingivitis. J Periodontol 2008;79:4-24. Vincent SD, Fotos PG, Baker KA, and Williams TP. Oral lichen planus: the clinical, historical, and therapeutic features of 100 cases. Oral Surg Oral Med Oral Pathol 1990;70:165-71.